Jim Hardee’s latest fur trade work. Jim Hardee’s latest vol. 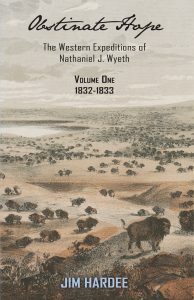 of Nathaniel Wyeth’s time in the fur trade. On his first expedition to the Pacific Northwest, Nathaniel Jarvis Wyeth learned enough about the region to develop an optimistic plan of action for his second adventure that he hoped would earn him a fortune. But grand visions, even backed by experience, planning, and committed investors, do not always produce the desired outcome. 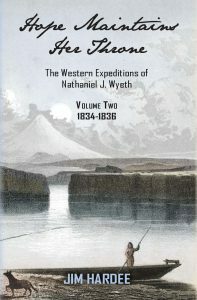 Volume Two examines how he put into effect this hard earned knowledge on his second journey west, including his dismay at being beaten to the 1834 rendezvous by William Sublette’s supply caravan, and ultimately establishing Fort Hall on the Snake River. This trading post was destined to play an integral role in America’s western expansion. Hardee constructs a panoramic view of the Boston ice merchant’s world, filled with fascinating details about the people, the challenges, and the economic conditions that conspired for and against Wyeth’s dream. Hardee brings new information and insights to a story of driving ambition and creativity most historians think they know well. Hardback with full color dustjacket, 500 pages, black and white illustrations, 6×9 inches. Order the 2 volumes together to get a discount!!! Click HERE to order the two volumes for a discounted price of $44.95!